Acoustic monitoring of the calls of marine animals, such as whales and seals, could be the key to identifying new species, finding new population groups and mapping migration routes. We recently used custom-designed detection algorithms to run through 57,000 hours of underwater ocean noise to find the songs of endangered blue whales, rather than listening for each whale call. This detection program saved us an enormous amount of processing time and will be critical in future acoustic monitoring research. Some endangered marine animals, including several whale and seal species, are “cryptic species”: they’re genetically different but look alike. This means that they are often mistaken for one another when identified visually, making conservation plans difficult to implement. However, most animals produce species-specific calls. Eavesdropping on their calls therefore provides a unique way to monitor them. This is completely rewriting our understanding of their population recovery. We recently discovered two new blue whale populations migrating off the east coast of Australia using this technology. This is important news as the blue whale has been slow to recover after being hunted to the brink of extinction. How can the largest animal that has ever lived, the Antarctic blue whale, swim undetected just off the coast of Sydney? 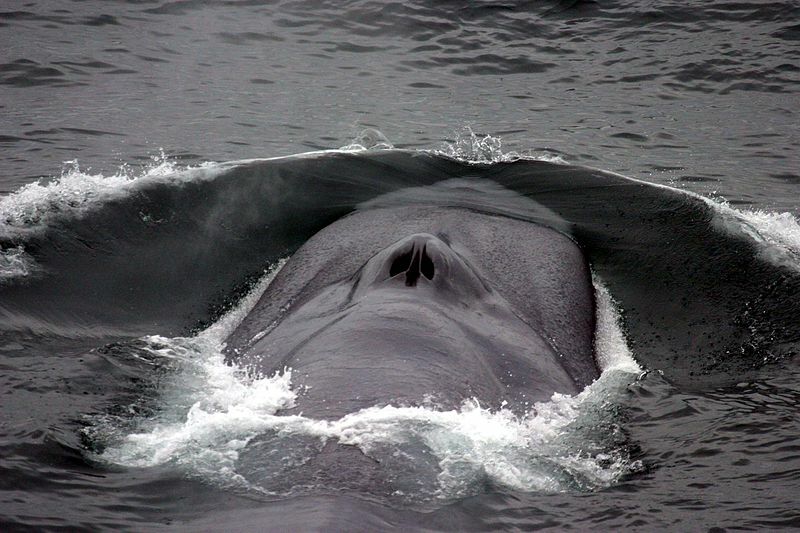 Blue whale (Balaenoptera musculus) with its bow wave, showing the blowhole. It is remarkable that we have only now discovered them there. It is possible that they only started using this route recently, or perhaps they have been there all along and we have missed them. Fortunately for us, blue whales sing, allowing us to detect them using arrays of listening devices spanning sites across the Indian and Pacific oceans. However, the frequency of their song is so low that humans can’t hear it. Blue whales produce different calls and these calls possibly reflect different subspecies. Their different songs help the International Whaling Commission manage the recovery of these subspecies. Globally, there are at least nine separate blue whale acoustic populations, and Australia’s waters are home to at least three. The west coast of Australia is a well-known blue whale feeding ground and both the Australian pygmy and Antarctic blue whales are common there. Another popular blue whale feeding ground is in Southern Australia. Until recently the blue whales there were thought to be all pygmy blue whales, but it was discovered that the Antarctic blue whale is also found there. We were further surprised to find that the Antarctic blue whales remained all year off southern Australia. In some years, they did not return to their krill-rich Antarctic feeding grounds in the summer, as we’d expect. The east coast of Australia is not known as a blue whale site, so we were delighted to find two different acoustic populations in the Tasman Sea, all the way up to Samoa. We found the critically endangered Antarctic blue whale and, to the delight of our New Zealand colleagues, pygmy blue whales with a New Zealand accent. Tasmania now looks like the boundary point separating the Kiwi and Aussie speaking pygmy blue whales. Similar to whales, seals are also returning to our shoreline. Fur seals are an example of a marine cryptic species, and while some species are thriving, others are not. The different fur seal species look similar. In fact, unless you are a seal expert, or a seal, it can be difficult to tell them apart. But we can easily recognise the different species because they have very different calls. The seals can recognise further subtle differences in calls between one another. To maintain their breeding territories the male seals fight and bark incessantly. Each male has a distinctly different call. A male can recognise and respond differently to the voices of his neighbours, whose territory boundary lines have been established by weeks of confrontations, from the voices of unknown males that are potentially a threat to his territory. 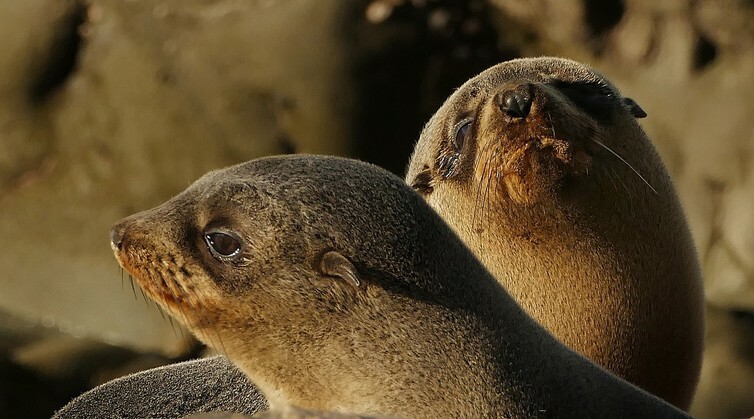 The female fur seals and their pups also have individually unique voices. When a female returns from sea after days of hunting, she needs to find her pup from the hundreds of other pups on the island. The mum and pup call to find one another in the busy, noisy colony. The female recognises her pup’s unique call and scent as part of the reunion. Spying on animal songs gives new insights into undiscovered populations and new migratory routes, completely rewriting our understanding of these marine giants. Accurately evaluating the population status and trends of cryptic marine species is critical in developing conservation management strategies.